The planning for the event starts several months out with a planning night held back in the club rooms. Each band is assigned a captain who leads the group responsible for that particular station. All up about 20 members are involved in some way in the design, construction and operation of the multi-multi portable station. Each year a new part of the system is constructed. 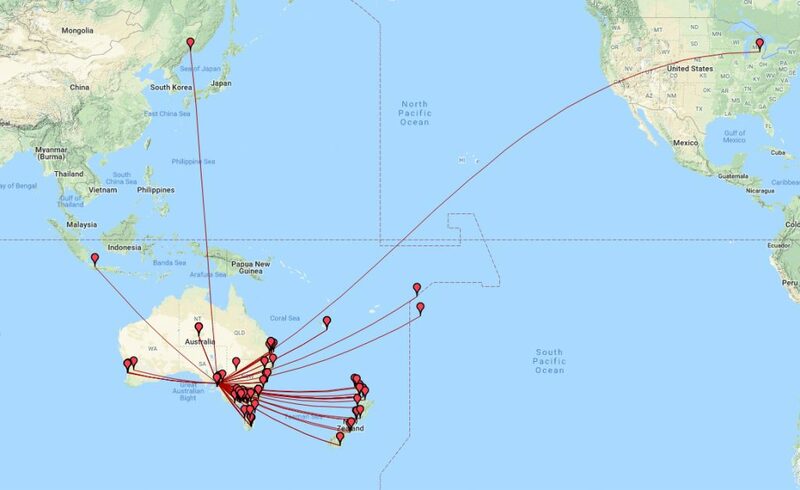 This years major advancements occurred firstly with the low band station lead by Steve VK5SFA and Grant VK5GR (160/80m). 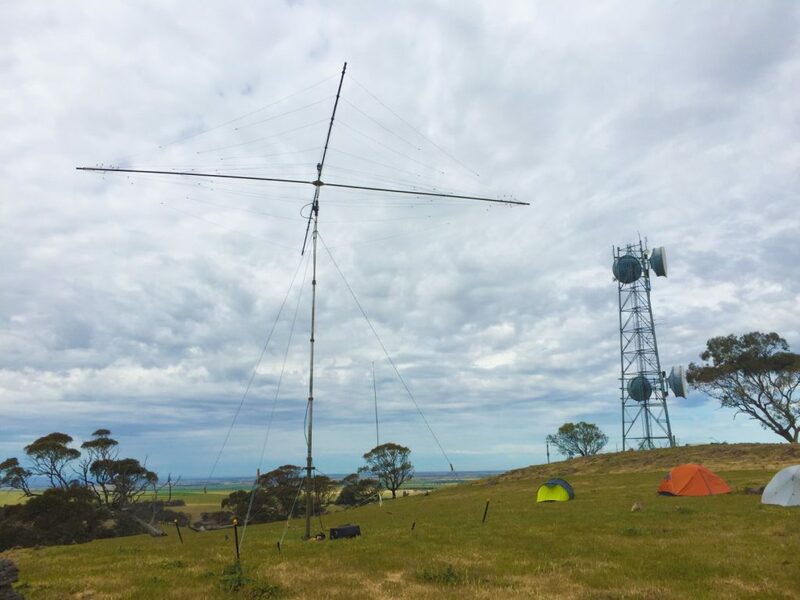 New vertical antennas were designed and tested, with the 80m antenna being trialed during the Trans Tasman Low Band Challenge contest in July. 80m was based on a folded 1/4 wave vertical monopole with elevated radials derived from a modified crankIR vertical. 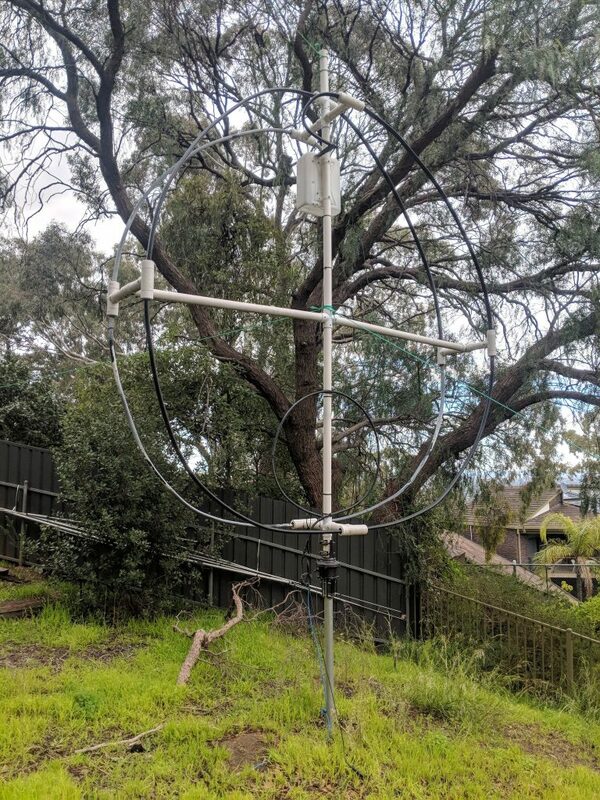 The 160m antenna was based on a capacity hat loaded 17m vertical (derived from designs by DJ0IP). After several working bees Steve gathered a group together and staged a test and tune day in a local park in Adelaide a few weeks before the event. The addition of these antennas this year replaced the dipoles used last year. The intention from moving to verticals was to lower the angle of radiation, thus (hopefully) improving our chances for DX. The low band station was then ready for action. 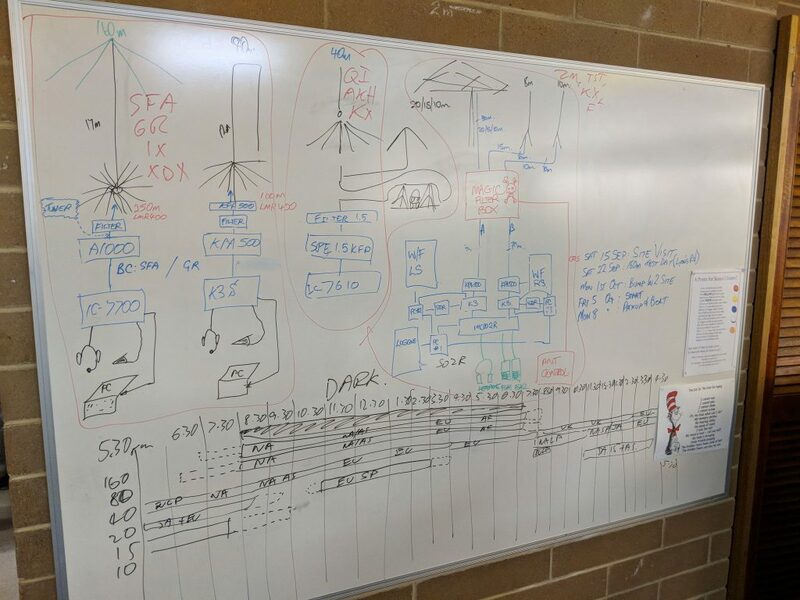 On the high band station Matt VK5ZM was scrambling to complete the design of the antenna switching network for the SO2R (Single Operator 2 Radio) 20/15/10m station. 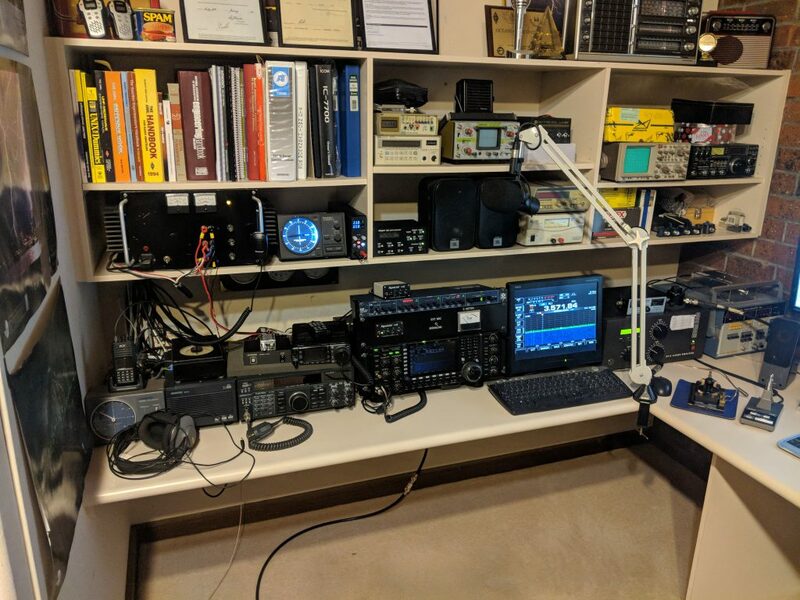 This system is unique in that it manages the antenna switching between both bands and radios to enable one operator to call CQ on two bands at the same time. Last year was the first time “the beast” as it is known was tried. This year the rest of the automation needed to be completed with the antenna selection and switching boards. Matt worked tirelessly to complete the system integration in time. After all the preparations we were ready for the contest weekend. 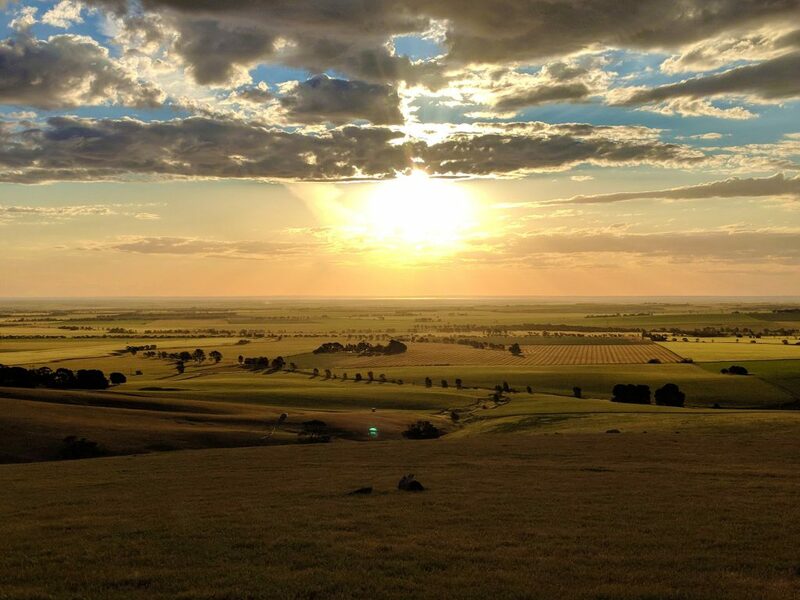 With a virgin site to occupy, members started out early from Adelaide on the Friday. 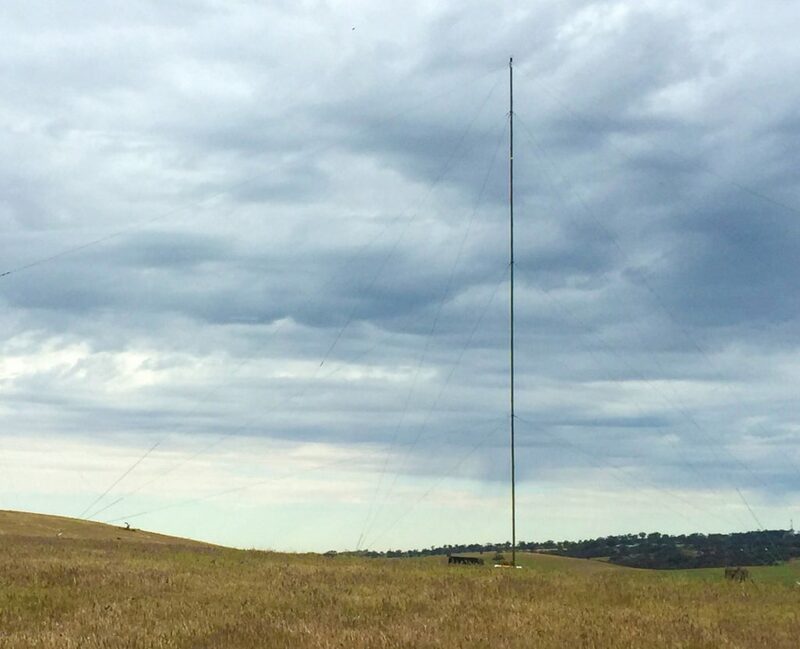 The first antenna to make it into the air was the 80m vertical, ready by about 11am. Oly VK5XDX, Steve VK5SFA, Grant VK5GR and Mark VK5QI all helped getting the first array into the air. Team 2 then arrived and started on the 40m antennas while Team 1 started on 160m. Lead by Andy VK5AKH, the 40m team included Peter VK5KX, Gerard VK5ZCV, Paul VK5PH and Scott VK5TST (who also set up the camp kitchen). 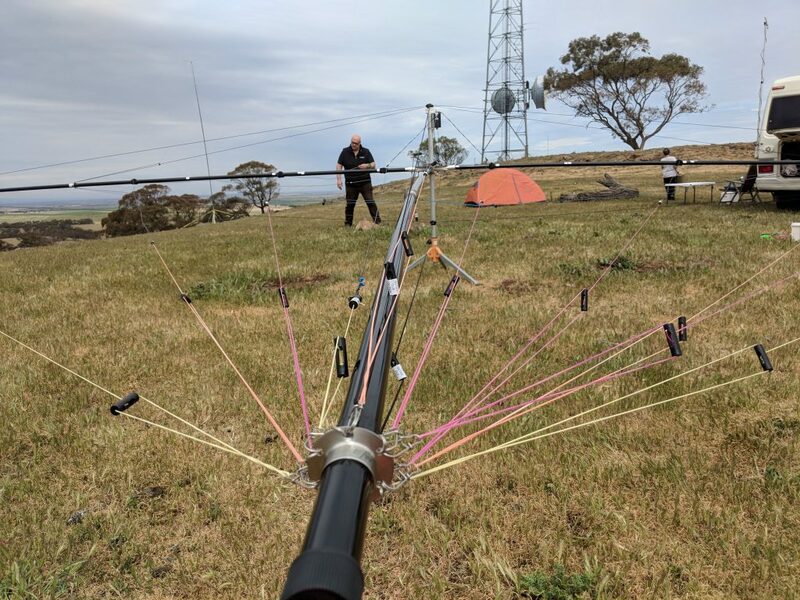 The 40m team got cracking and in short order got their first antenna in the air as well, which was an inverted V intended for domestic contacts (much higher angle of radiation). While the inverted V went up work progressed preparing to raise the 160m antenna. This was the first trial of the weekend. 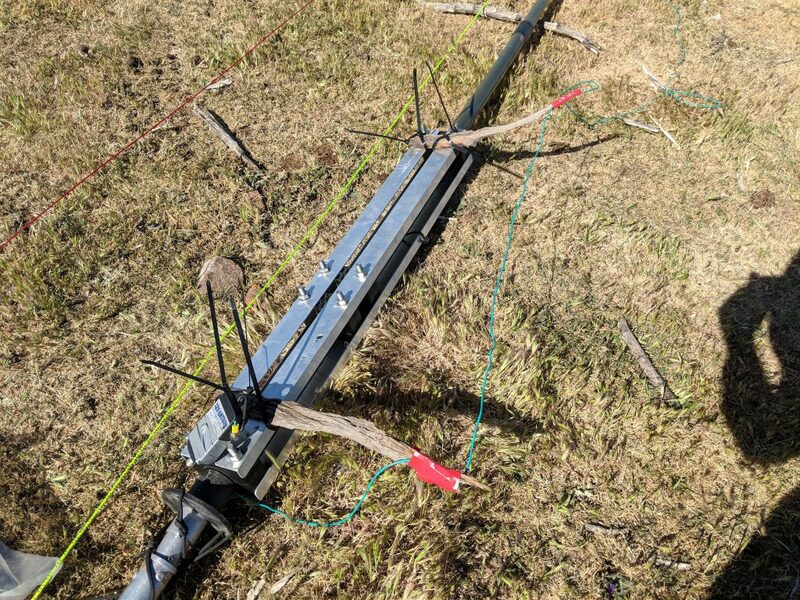 As the antenna was raised, the top 7m section which was made from a 9m squid pole failed. 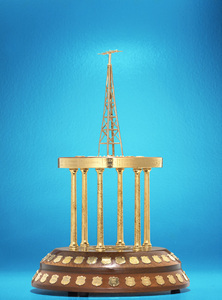 The top hat wires were proving to be quite heavy and hard to control as the tower was raised using a temporary derrick. Fortunately the squid pole wasn’t damaged and we were able to lower the array and reset for a second try. Unfortunately Murphy had invaded the site and the next 3 attempts didn’t go any better, with the 4th try seeing the demise of the squid pole as it shattered. The moral of the story was that Squid poles are just not sturdy enough for this application,and the capacity hat wires should be made of lighter materials. 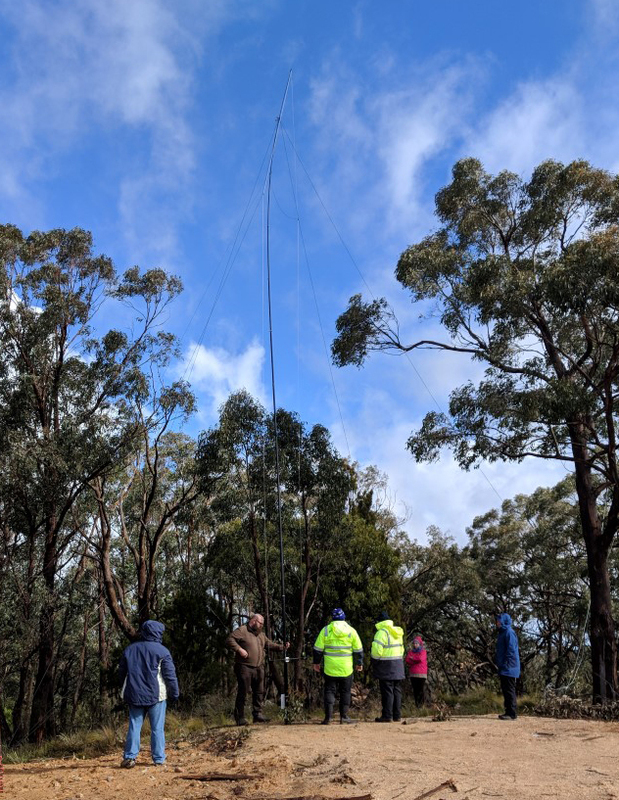 Facing the prospect of no 160m antenna at all, the team hit upon a plan to put up a 12m version of the antenna, and compensate with the antenna matching unit. Finally on the 5th attempt with the light failing the antenna and its 700m worth of radials came into resonance with a good VSWR. Time would tell whether it would radiate well the next night as the contest started. Team 2 on 40m meanwhile was having more luck. 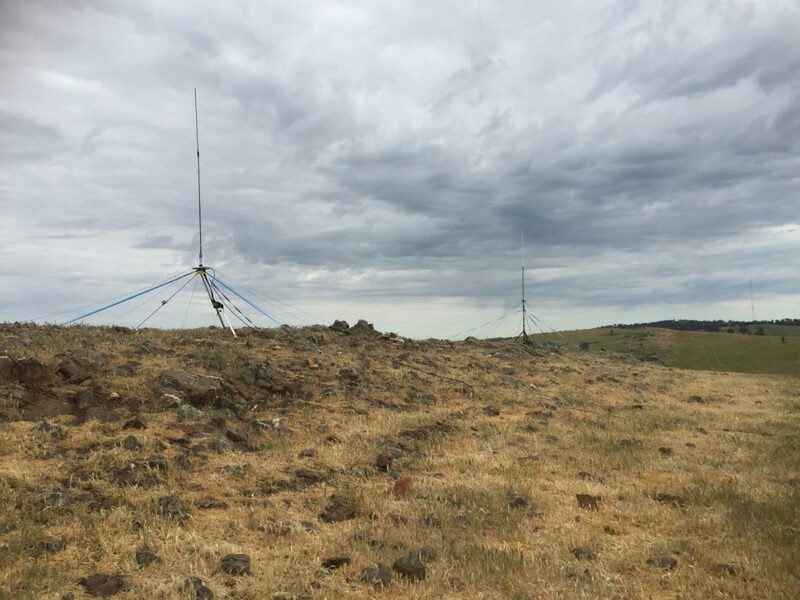 Their second antenna was an elevated feed 40m quarter-wave vertical with elevated radials. After realizing a couple of components of the feed system had been left behind, some bush mechanics were performed and the antenna climbed into the sky. The WIFI coax relay switch was installed and the LMR400 feeders for both 160 and 40m were run nearly 200m back to the operating hut. 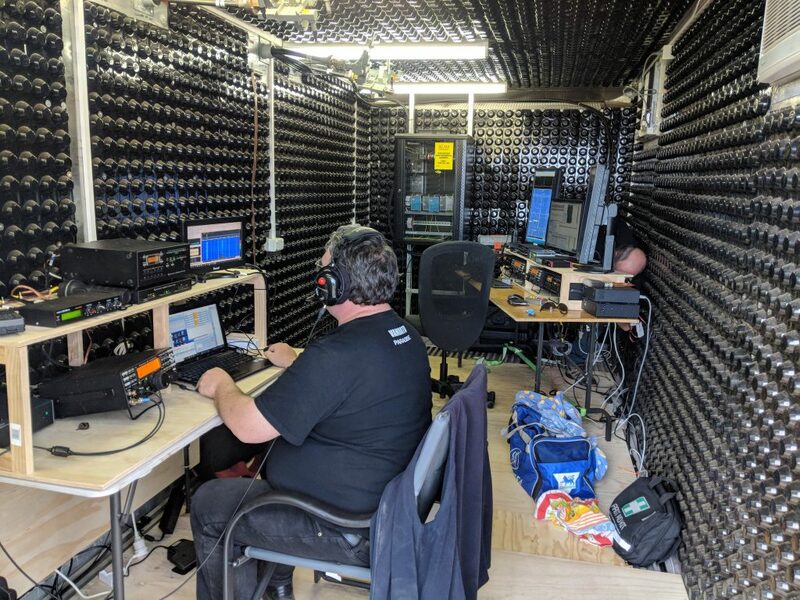 Finally, the 40m station was setup and the team began test contacts during Friday night using a ICOM IC7610 and SPE 1.3KFA linear followed by a Low Band Systems 1500W filter. Compared the last year we were back on schedule with all antennas in the air for 160-40m by the end of day 1. Saturday saw more of the construction crew arrive and work start on the high band station as well as loading all of the radios into the operating cabin. Matt VK5ZM arrived with his done Daniel VK5FDNA and then the team was joined by Darin VK5IX and Kim VK5FJ who bolstered the crew building the high band station. By now there are people everywhere (so if I have missed someone please let me know so I can add you). 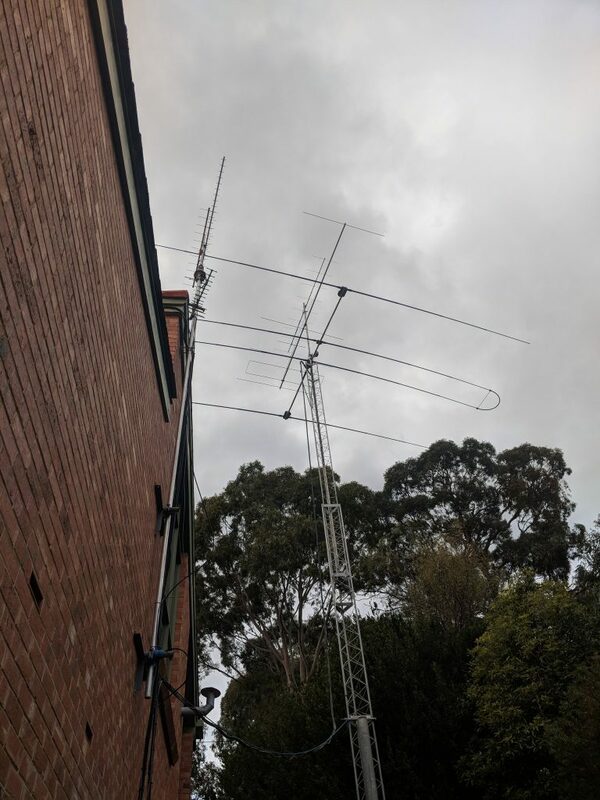 By lunchtime the last of the antennas were deployed with the verticals setup for 21 and 28MHz and the tri-band spider beam was in the air for 20/15/10m. The antenna combining and switching network was also established. To support the station, a tent city was assembled providing sleeping quarters for the radio crew. Site logistics were managed and the kitchen staffed by Scott VK5TST. A key aspect of the event is to keep the team well caffeinated and fed. Assisted by Sharon VK5FSAW who shopped and planned the menu, Scott kept everyone plied with everything their stomachs desired. So far this year the team had been blessed with excellent weather as well. Unlike last year when the station was built with 30-40knot winds howling over the hills, it was mostly calm this year making construction much easier. Finally, as the start time approached, the finishing touches were put on the station and facilities. 40/80 and 160m opened up on queue at 0800z and the contest began. Murphy however decided to show his hand again, this time around the high band station. PTT switching issues were uncovered at the last minute and unfortunately the TR switching was damaged in one of the SO2R station amplifiers. 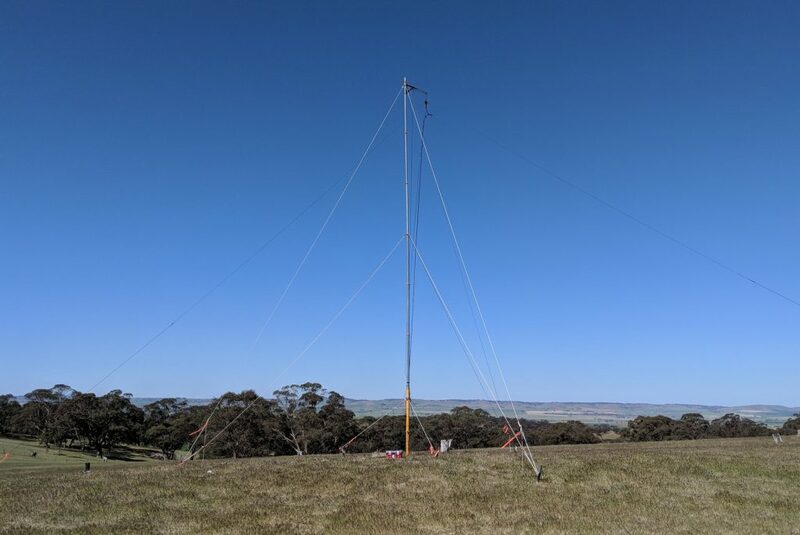 Matt VK5ZM struggled on but in the end the last minute rush to complete the development of the antenna switching network the preceding week meant that there just wasn’t enough time to debug the rest of the SO2R station. About 30 minutes into the contest the sad decision was made to demote it to a single radio. This delayed activating the 20m station by about an hour. None the less, once all was ready away we went with 3 active operating positions across 4 bands (with manual switching on 80/160m). 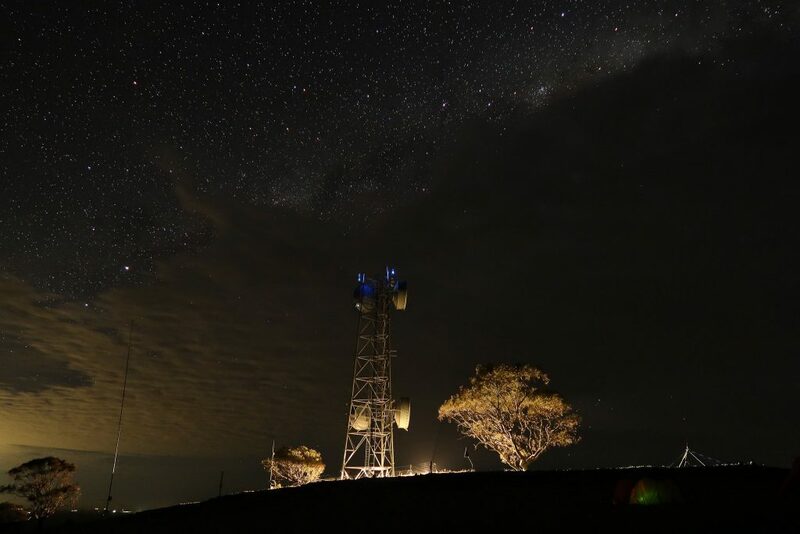 Night fell, dinner was served and everyone settled into the routine of calling CQ. Oly, who was a new contester in the team quickly proved he was a machine on both the 160/80 and the 20m station while a steady crew manned 40m. 40m meanwhile was powering along as well with lots of traffic from Europe as well as a reasonable amount from North America. 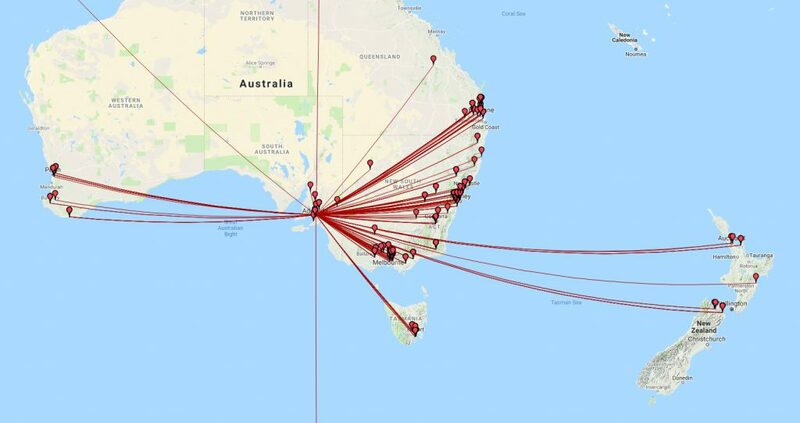 Nighttime on 40m was hard going however when the band filled with a huge number of YB contest stations. This should have been a blessing, but obviously their noise floor was such that they couldn’t hear our 400W despite our 5×9 copy of them. As the night wore on, 80m was hit by another curse. Two of the dreaded northern radar stations appeared, one taking out 3720-3780 and another taking 3790-3850. 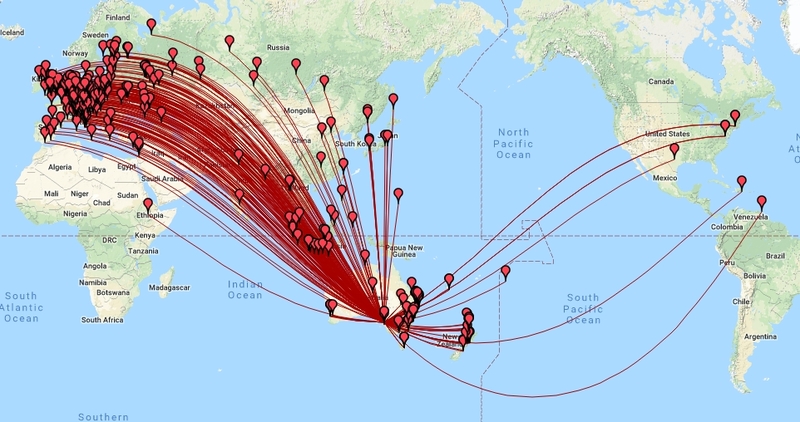 For a while we had a 10kHz gap in which to eek out contacts before one of the radars moved down to fill it – thus putting an end to any aspirations of working DX on 80m. 20m meanwhile powered on into the night before giving up on Short Path Europe around midnight. At this point, we entered the “long dark teatime of the soul” in contesting – the graveyard shift where we called incessantly but made little progress. Little did we know that with sunrise things were about to get much worst. The team had been watching the solar forecasts for the preceding couple of days and had reached the point where we were dreading what would happen on Sunday. Sure enough, just when we didn’t want them to, the predictions came true with a geomagnetic storm starting on the daylight side of the planet over the Pacific. We watched as the T index dived lower and lower, creeping across the equator and rendering our North American and later our Asian and European (LP) paths useless. Even contact with Japan was problematic. Then the real rub set in. We would call JA stations we could hear, but they would answer with us saying “Sorry no contact JA Only!”. 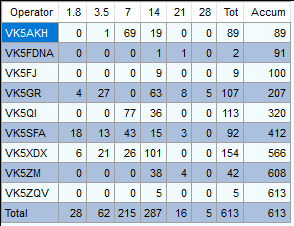 There was a JA domestic contest on and they did not want to give us a QSO! We tried repeatedly Sunday morning on 20m and occasionally on 15m but to no avail. Robbed of our one great hope for prefix multipliers in JA, plus no North American short path (and only a fleeting 20 minute long path NA opening) our score progressed along at a glacial pace. In the face of adversity we soldiered on and took the time to train some new operators. 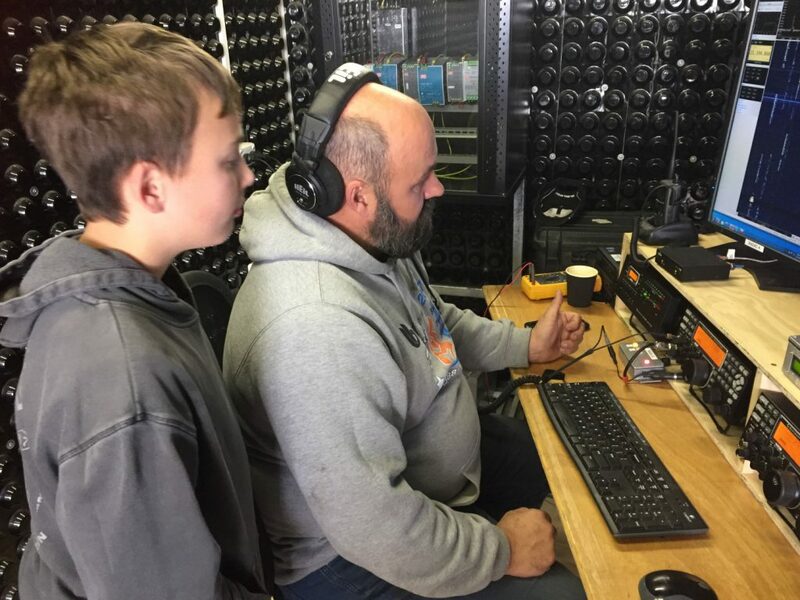 11 Year old Daniel VK5FDNA, who had only just qualified for his foundation license a few weeks before, was coached through a couple of contacts with his dad Matt VK5ZM. Meanwhile we also had Gerard VK5ZCV get some practice in as well. It was clear we weren’t going to set any records this year so we decided to use the time we had well, sowing the seeds for next year. We also had some visitors to the site during Sunday with Ben VK5BB and Olga VK5FOLG making the trip up for a look as did Paul VK5PH. Ady (newly licensed as VK5FADE) brought his family along to see what it was that we had been talking about at the club over the past couple of months. It was great to see some new faces looking to discover what the contest station and scene was all about. 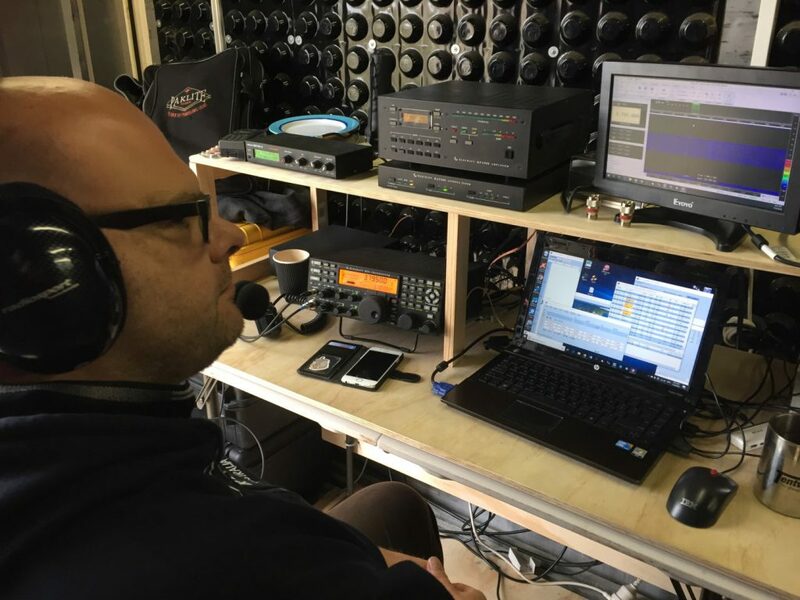 Later in the afternoon 40m came back to life and we were able to put a few more EU and South American stations in the log. 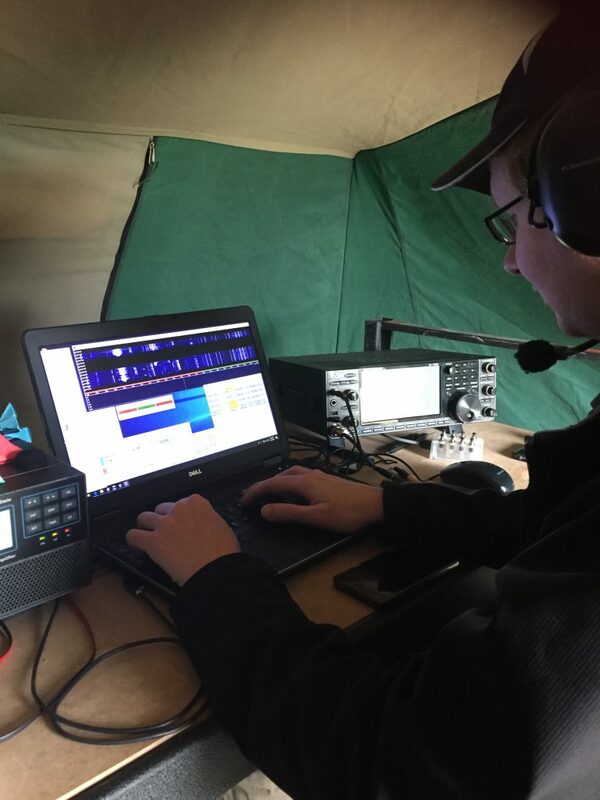 Finally as the contest drew to a close, it seemed on 20m at least as though we ran out of stations to work. The signals we could hear were all in the log. We had even stooped so low as to beg a contact from a couple of VK nets. In the end we could only muster less than half our score from 2017. Given the amount of effort that went in to building the station, a bit of a disappointing result, however a result none the less. So, as the sun set over the site, the station wound down. The team then retired to the meals area for a baked potato feast with all the trimmings. After dinner quite a few headed for home and a comfortable bed while the die hards remained on site to work some more DX. The next morning fresh troops arrived from Adelaide, and the process of packing up began. Our luck with the weather finally failed us with winds approaching 40 knots ripping over the site. None the less, timed between gusts, all the antennas were safely lowered to the ground and carefully packed back into their cases and bags for transport home. What had taken 2 days to build was secured on trailers and ready to roll in under 5 hours. The remains of the team then headed to Kapunda Bakery for lunch before dispersing back to our home QTHs ready to think about 2019. VK5TST, VK5XDX, VK5SFA, VK5GR, VK5AKH, VK5QI, VK5FJ, VK5ZM, VK5FDNA, VK5KX, VK5ZCV, VK5PH, VK5IX, VK5FSAW who all helped design, construct, provide logistics in terms of food and sanitation, man the station on air and then tear down VK5ARG for 2018! (and apologies if I have missed someone). It is a huge team effort each year and this year was no exception. 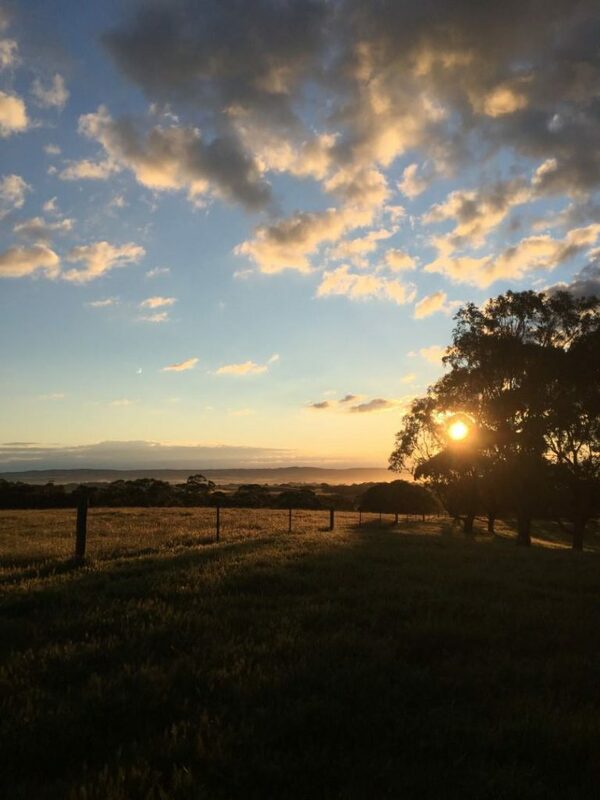 The Low Band station team for the AREG OCDX effort this year are planning a working bee this Sunday (Sept 23rd) starting at 1pm. 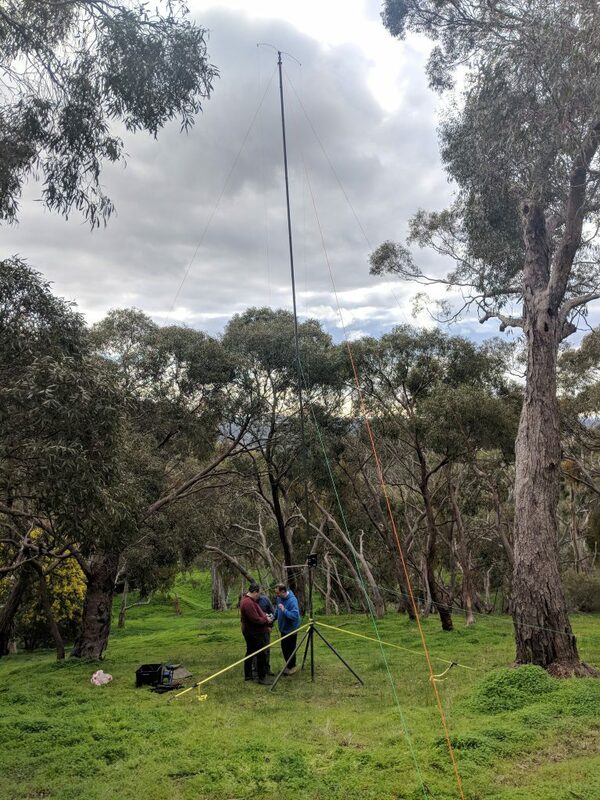 The aim is to erect, tune and test the 160m vertical that we plan on using for the contest. 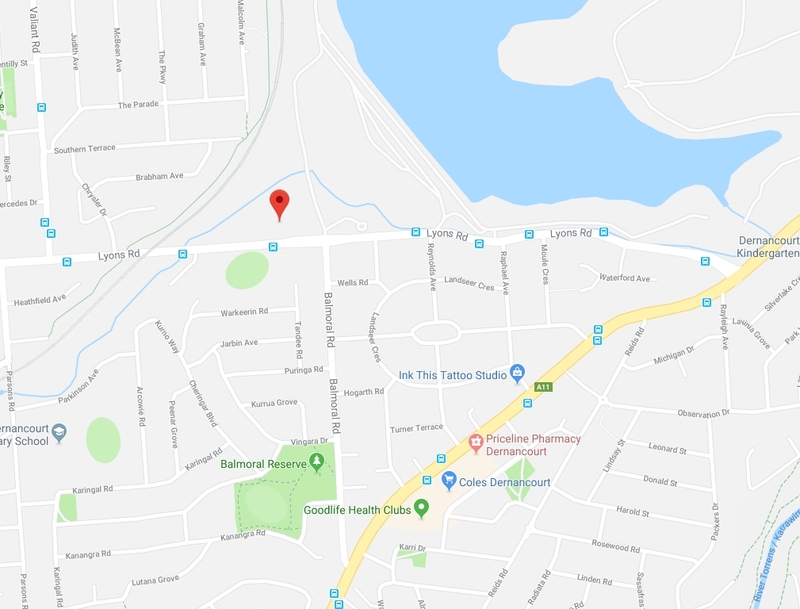 We will be using the vacant paddock on Lyons Road in Dernancourt just west of the Hope Valley reservoir (opposite the community hall). If you would like to come and help, offer words of encouragement or go for a walk laying 700m of radials out, you would be most welcome. As the wavelength suggests, everything is big at 160m. 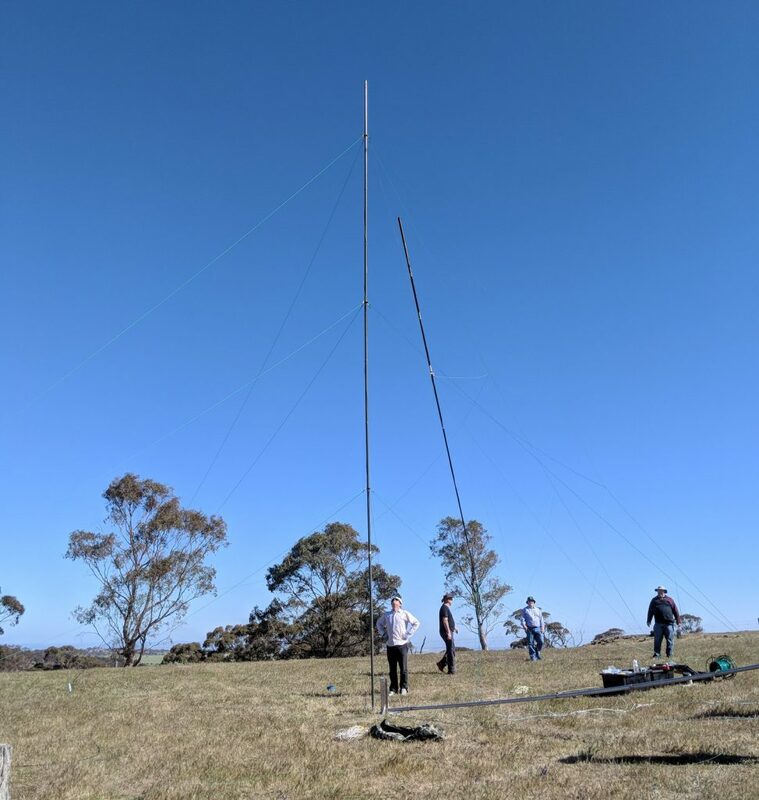 The vertical will be 17m tall and have 16x40m ground radials so it will take a bit to get it in the air. Any help will be welcome. We also plan on doing a verification test of the 80m vertical as well time permitting. 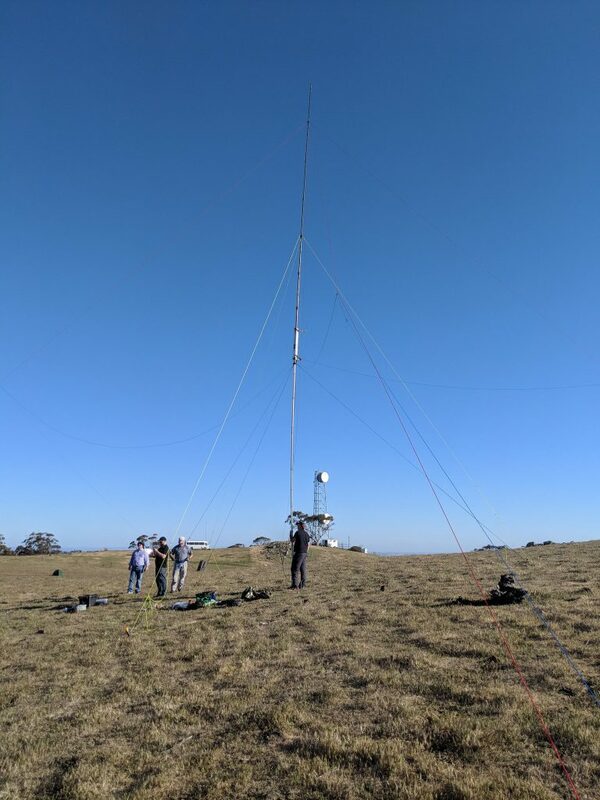 Update: 24th September – we had the antenna in the air on Sunday after a couple of mechanical hiccups. Tuning was proving a little complicated and an alternate matching network is being drawn up to overcome this. Here are some photos from the tune and test day. A big thanks to everyone who came along and helped (VK5FGRY, VK5FO, VK5RR, VK5TST, VK5XDX, VK5SL, VK5GR, VK5SFA, VK5ZAR). 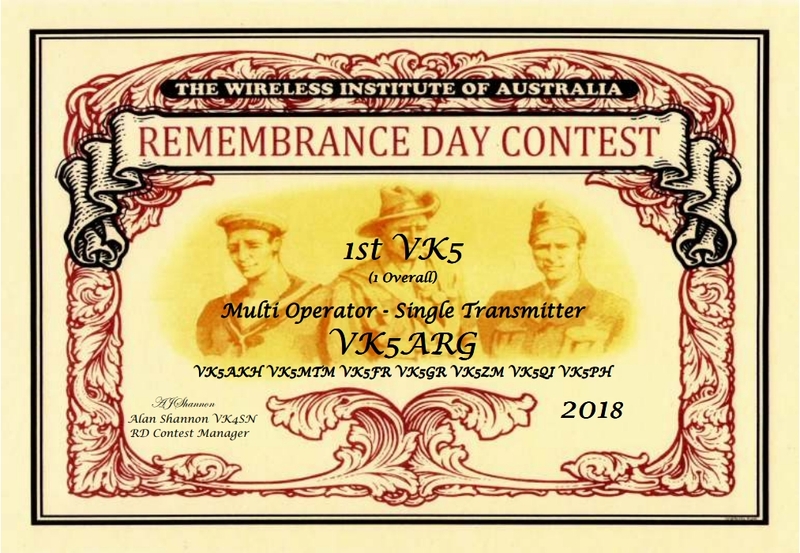 The Remembrance Day Contest Results are out for 2018 and we are pleased to announce that VK5ARG scored first place this year in the Multi-One category with 875 points. Thank you team for all your efforts in the freezing conditions and we look forward to running it again in 2019! A special thanks also to Paul VK5PH who let us use his hills QTH for the event. 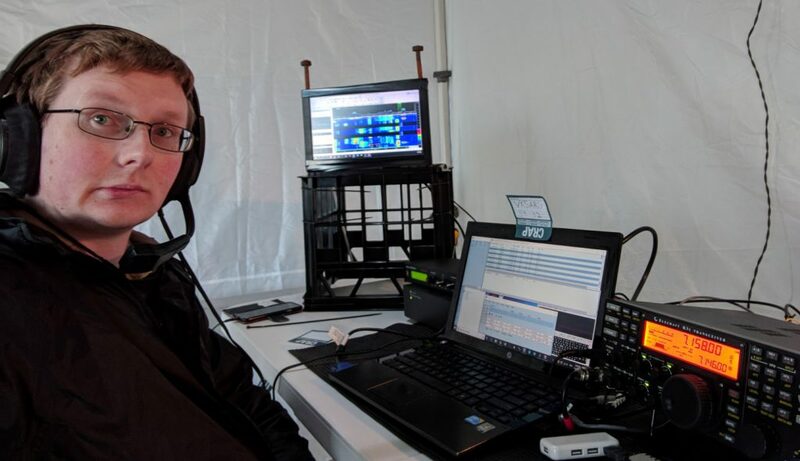 Another TT-Lowband contest has come and gone and this year AREG has set a new personal best score! A huge thanks to everyone who came along and operated, helped set up or sat in the bleechers cheering us on. 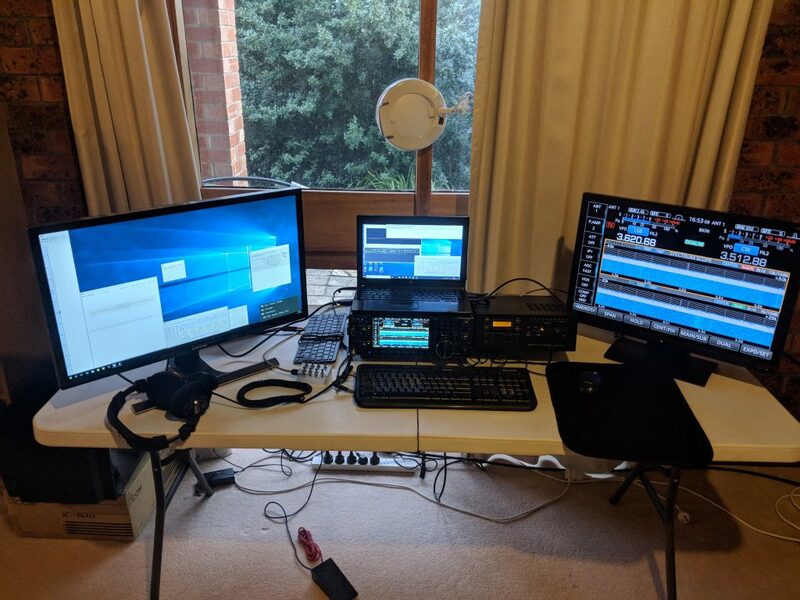 A huge thanks to Steve VK5SFA who allowed us to setup a 3 seat Multi-Multi station in his home covering all three bands. 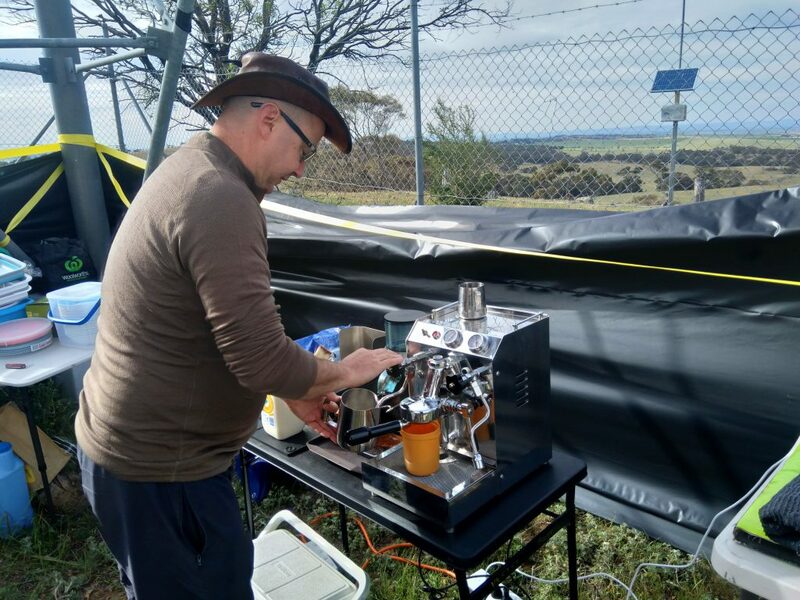 Steve also fed the team (the BBQ was excellent) and kept us plied with copious quantities of coffee! 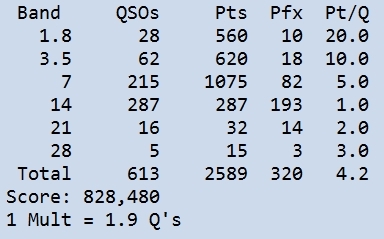 The unofficial final score was 5360 points for 280 QSOs over the 6 hour event. We now eagerly await the official results. 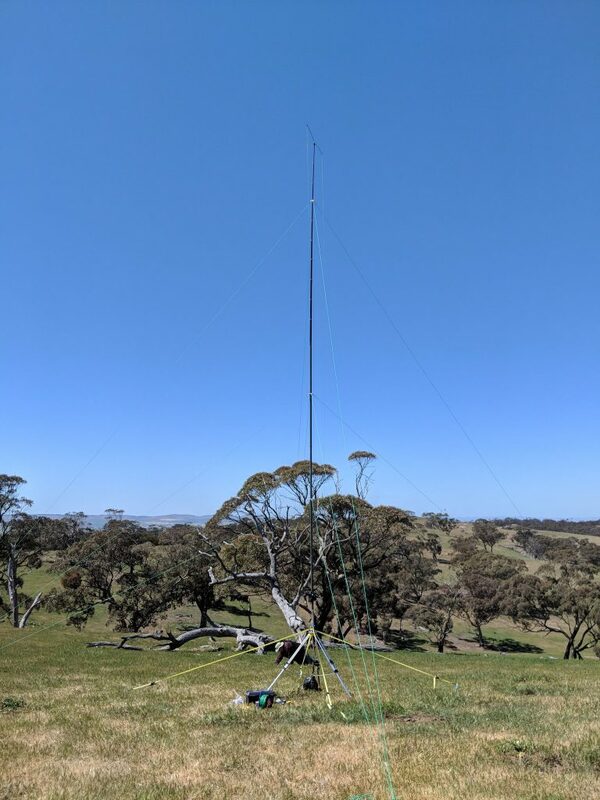 80m – we had a choice of 2 antennas – an Inverted V with it’s apex at ~9m above ground as an NVIS antenna and an 80m monopole which worked better for the longer paths such as ZL. All stations were running 400W PEP simultaneously thanks to a set of 500W rated filters from Low Band Systems loaned to us by Peter VK5KX (thanks Pete!). We had a great turnout from the club with lots of people contributing. 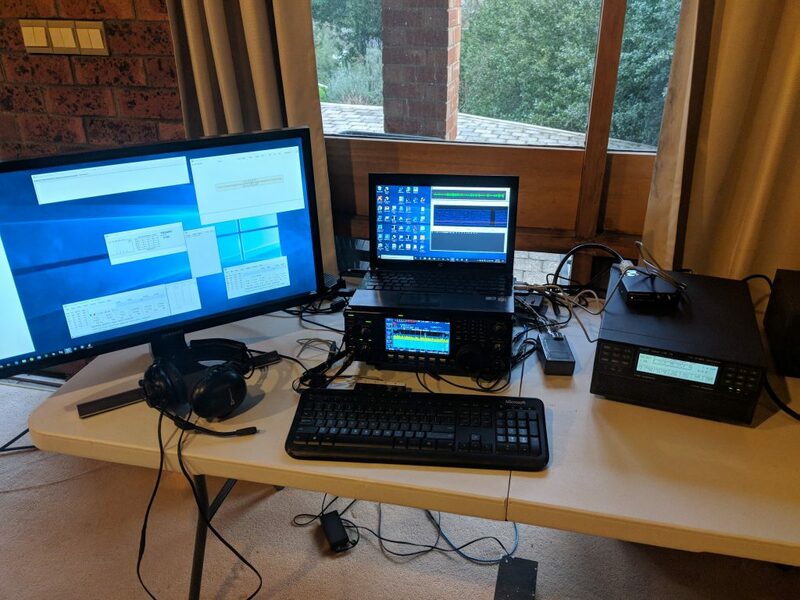 Thanks must be given to Grant VK5GR, Mark VK5QI and Andrew VK5AKH who together with Steve provided the station equipment. Chris VK5FR also helped with installation on the day. We were also visited by Ben VK5BB and Olga VK5FOLG whom we are trying to recruit as future contest operators – great to see you drop by! The operating team then consisted of Theo VK5MTM, Darin VK5IX, Steve VK5SFA, Grant VK5GR, Mark VK5QI, Andrew VK5AKH. Between the 6 of us we kept all three stations manned running CW and SSB for the full 6 hours – a fantastic result. We also had Matthew VK5ZM and his son Daniel along with Darin’s son Cameron and Steve’s wife Linda as the cheer squad. It was all most pleasant being able to sit in the lounge chairs with the contestors going hard at it all around us. A fantastic atmosphere and a great night. So how did it go? 80m was the stand out band of the evening with it generating the majority of the contacts. 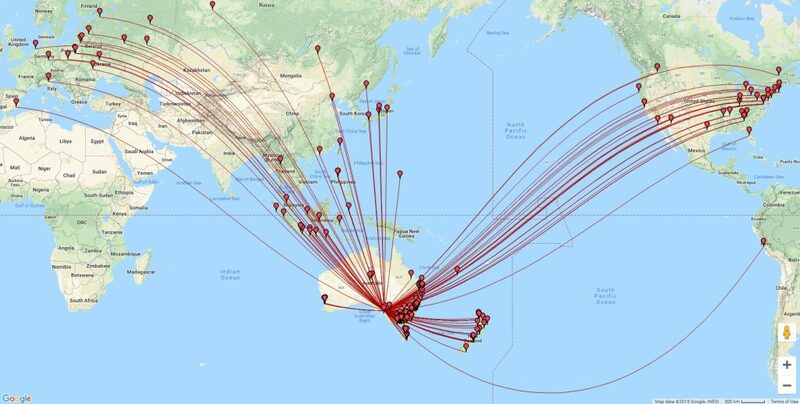 40m was great early on but once the sun set across the contest area the band filled up with stations from across the Pacific with the hum of several other contests running at the same time. Unfortunately the TT Low Band contest doesn’t allow you to log calls from other than VK & ZL so 40m became very hard going later in the evening. 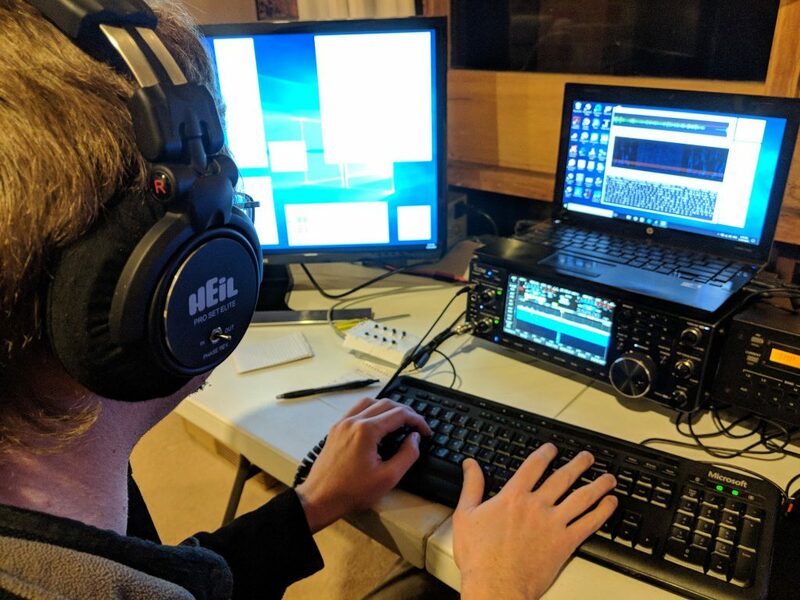 160m saw a steady stream of signals throughout the night and was a lot of fun, although challenging to work search and pounce as it would take 2-3 minutes to change even 5kHz in frequency to call someone new on SSB. Overall it was a great night and this year has cemented this as a regular fixture in the club’s contesting calendar! We now eagerly look forward to the results to see how we did! 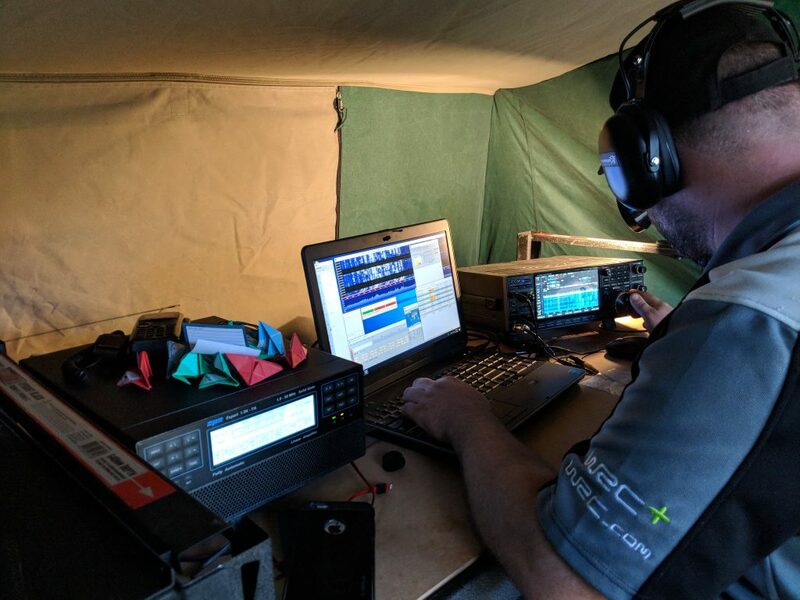 This year AREG has a new site to trial for the OCDX Contest. With exceptional HF take off angles in all major directions this site could be something special. Work installing the 160-10m station started today with 160-40m complete (mostly) and work begun on 20 + 15/10m. That will be completed in the morning! A team of members set to work on the weekend preparing parts of the 20m and 40m station. Construction and tuning of the 20m three element beam was completed and work on the new 40m vertical progressed as well. Thanks to everyone who was able to take part.